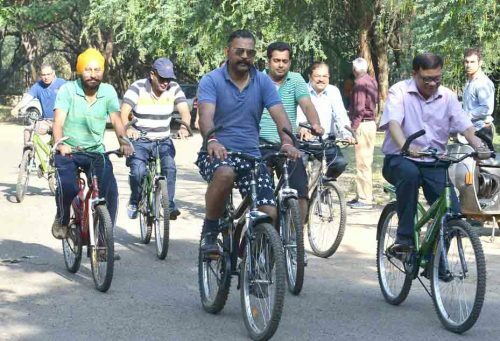 CHANDIGARH, MAY 1 : Members of the Chandigarh Press Club in association with the Department of Forests on Sunday participated in a three-km ‘greenathon’ at the Sukhna Lake reserved forests with the aim to keep the club journalists fit and think ‘green’. More than 30 journalists and their families participated in the first-of-its-kind cycling event, which will now be a regular feature, Press Club president Jaswant Singh Rana said. He said the event also helped bringing the journalists, who are overworked, closer to nature. “In our daily hectic routine, it’s somehow difficult to spare a time for self and for the family. So we have decided to organise a cycling expedition, initially at a smaller stretch, which can evaluate one’s fitness level,” Rana said. Advocating cycle-ride to office, he said the Press Club would also launch a campaign to promote cycling and to prevent pollution. The bicycles at the lake were provided by the Forest Department. Chandigarh Chief Conservator of Forests Santosh Kumar briefed the journalists and their families about the native flora and fauna that the Sukhna reserved forests supports. It’s home to a variety of butterflies, birds and mammals like the wild boar, the pangolin, the ongoose and the blue bull and reptiles like the Indian python and Russell’s viper. Forest range officer Karan Singh was also present on the occasion.